The volcanic island of milos is horseshoe shaped by the caldera that almost seems to split the island in two. This Cycladic island is a geological treasure with its abundance of Obsidian, Tuff (consolidated volcanic ash) and Trachyte (igneous volcanic origin). The Caldera is now flooded, similar to the Santorini situation, and offers a large natural harbour with Adamas port at the northeast shore. Depth of this inland sea is 132 metres max. The southern shore is blessed with many interesting anchorages (see my yacht charters guide) interesting both because of the impression geology (rock formations, sulphurous springs and fumaroles) but also because of sheer beauty. Above the principal port of Adamas lies the Chora, from which the island of Antimelos or Antimilos can be seen guarding the entrance of the natural harbour. There are no anchorages but it reported that in perfect calm it is possible to get onshore and explore the ruins of a reasonably large settlement. Milos and the surrounding islands of Kimolos, Polyaigos, Folegandros and Sifnos form a mini-cruise area worth spending well over a week of your yacht charter - sailing holidays. 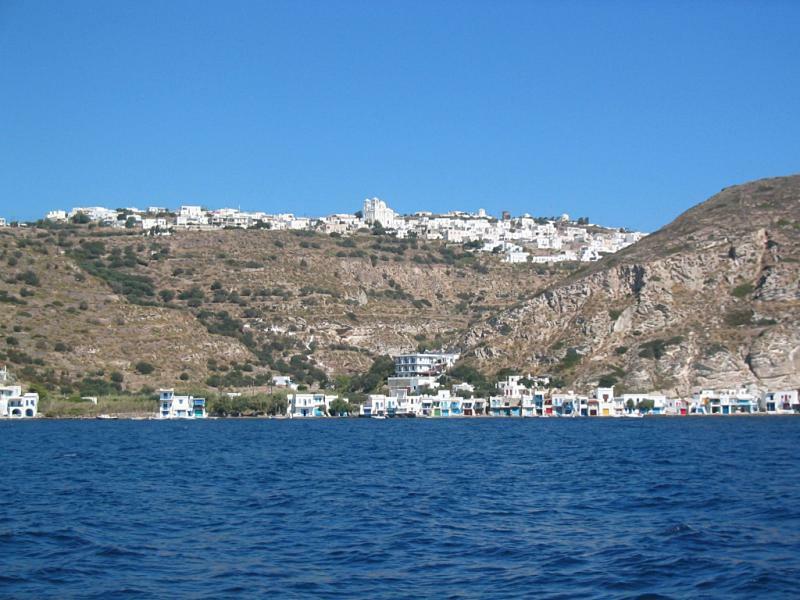 The nearest charter base is Paroikia port on Paros. Other photos of the Chora of Sikinos and the Chora of Kythera or Kythira.